Recently I had a craving for one of my favorite dishes from my mother’s suburban mid-century kitchen. I’d always believed her Hungarian cauliflower casserole was an authentic dish. It seemed the perfect thing to eat on a winter night when I was having people over for a Chanukah meal and I couldn’t look at another latke and someone else was making the ponchkes. Yes, Chanukah means fried food and I was all fried-out. It occurred to me that mom’s cauliflower dish would be a nod to tradition and also a sort of deconstructed latke . 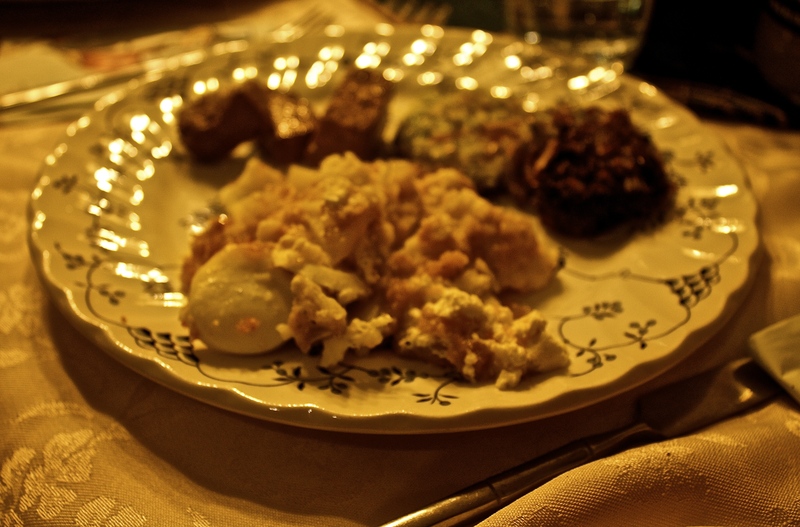 It would also, like every Hungarian vegetable dish I’d ever had (heavy on the butter and sour cream) line our stomachs. To me it always seemed the ultimate winter comfort food. Even as a kid, I sort of knew that it wasn’t totally authentic. I remembered mom telling me that the cauliflower was a later addition. Later, a post-college roommate who also had Hungarian heritage made it with veggie sausage (she, too, only ate kosher) and when I checked with mom, she told me that indeed this was really a potato and sausage dish. 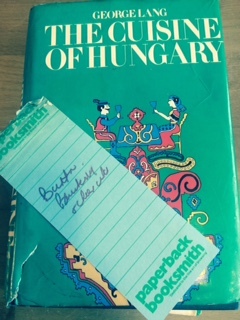 Recently I consulted the Bible of Hungarian cooking, George Lang’s The Cuisine of Hungary. Preheat oven to 350. Drop potatoes in their skins in water to cover with 1 tablespoon salt. Cook until tender. Peel and slice potatoes. Do the same with the hard-boiled eggs. Butter a heatproof glass dish well. Arrange a layer of sliced potatoes neatly on the bottom of the dish. Season with salt. Melt the butter in the top part of a double boiler. Sprinkle a little on top of potatoes. Cover this layer with ham slices and top with another layer of sliced potatoes. Again season with salt and sprinkle with melted butter. Arrange egg slices and sausage slices on top. Finish with a final layer of potatoes. Pour any remaining butter on top. Spread sour cream over all and sprinkle with paprika. Bake in the pre-heated oven for 30 minutes. One of the great points that Lang makes in the first part of his book which is a treatise on Hungarian food is that there is no one great version of a classic Hungarian dish. Each Hungarian cook had her own version of a classic dish. Your grandma’s dobos torte might not have been like my grandma’s dobos torte and that’s fine. In any event, there are some essential elements of Lang’s potato dish that exist in my mother’s dish (which presumably came from my grandmother and her mother and so on) which I would not and do not change—even though some are at odds with current food trends and also it is likely that all those sour-cream and butter-dousing vegetable eaters in the old days in Hungary may have spent more time on manual labor burning off some more calories than we do. Lang points out that Hungarians never served plain vegetable dishes and wouldn’t have known what to make of a plain boiled vegetable served alone. To sum up, what mom’s dish has in commons with Lang’s and what I won’t give up (at least the 2 times a year that I make my mother’s cauliflower casserole): potatoes boiled in jackets: check. Boiled eggs: check. Butter: check (as I think Julia Child said, it gives things flavor); Sour cream: I actually have found I can get away with no fat sour cream. Another old-timey feature of mom’s dish is boiling the cauliflower. I love roasted cauliflower in general, but in this dish, I’m all about boiling, then roasting, then covering with butter, sour cream, and this leads to my last digression . . .
Before Passover last year, my nephew and his wife (to whom I swear I am about to send mom’s first edition copy of Lang’s book) requested mom’s cauliflower casserole recipe, demonstrating that this is a beloved family recipe through the generations. It was interesting to me that he sees this as a Passover recipe, which it is only if you eliminate what I consider one of its essential ingredients: cornflake crumbs. Now some of my readers may quibble and point out that it’s possible that there no cornflake crumbs in early 20th century Hungary or even before that. This may be true. I’ll leave that question those persnickety food historian types who will point out the Mr. Kellogg didn’t even invent whole corn flakes until the late 19th century in Michigan–and who knows when people got the idea of crumbling them and using them instead of breadcrumbs? But to me, along with the cauliflower, they are the soul of this dish and that is why I love my mother’s casserole as the quintessential blend of Budapest and Levittown. Butter a 2-quart Pyrex casserole (round or oblong) generously. Sprinkle bottom and sides with cornflake crumbs. Peel potatoes and eggs and slice each into slices around 1/8 inch thick. Alternate layers of potatoes, cauliflower, eggs, sour cream, and sprinkle liberally with salt and pepper. Begin an end with a layer of potatoes. Pour melted butter all over top layer. Sprinkle top with more cornflake crumbs, just like they would have done in Hungary—and then more butter—which I’m sure they did in Hungary. This is not a delicate casserole, so there’s no need to worry about getting the proportions right or not. As long as you use the right amount of corn flake crumbs (and mom’s recipe does not indicate what that is), it will be great. We usually served this hot out of the oven, but leftovers can be eaten hot or as mom at her most suburban notes: “cold leftovers make a unique potato salad.” That’s true without the ham–I can only imagine that this even better with the ham. One of my readers will have to let me know.